It’s Thanksgiving time. And once again, there will be no calorie lecture or list of forbidden foods from me — just a few wonderful, #healthy #recipes from health–conscious chefs. Healthy Recipe by: Editors at EatingWell magazine and the new cookbook, The Simple Art of EatingWell by Jessie Price and The EatingWell Test Kitchen (Countryman Press, #2010). Position a rack in the lower third of the oven; preheat the oven to 400°F. Rub off excess papery skin from the garlic heads without separating the cloves. Slice the tips off, exposing the ends of the cloves. Place the heads on a square of foil. Sprinkle with 4 teaspoons water and wrap into a package. Roast until very soft, 40 to 45 minutes. Unwrap and let cool. Zest the lemons and place the zest in a medium bowl. Juice the lemons into the bowl through a strainer to catch the seeds. Reserve the squeezed lemon skins. Add the miso, oil, chopped thyme and pepper to the lemon mixture. Squeeze the garlic cloves out of their skins into the bowl. Whisk until the mixture forms a paste. You can prepare the paste up to one week in advance and store it, covered, in the refrigerator. Reduce the oven temperature to 350°F. Set aside the turkey giblets and neck for making Turkey Giblet Stock, if desired. Pat the turkey dry with paper towels. Loosen the skin over the turkey breast and thigh meat. Rub the paste under the skin onto the breast meat and leg meat and a little inside the cavity. Tuck the wing tips under the turkey. Place the reserved squeezed lemon skins, thyme sprigs and 2 of the onion quarters in the cavity. (You may not use all the citrus skins.) Tie the legs together with kitchen string. Place the turkey breast–side up on a roasting rack set in a large roasting pan. Roast the turkey for 1 hour. Add 2 cups water and the remaining onion quarters to the pan, tent with foil and continue roasting for 1 hour more. Baste the turkey with the pan drippings and continue roasting, basting every 15 minutes or so, for 1 ½ to 2 hours longer, or until an instant–read thermometer inserted into the thickest part of a thigh without touching bone registers 165°F. Add water, 1 cup at a time, if the pan becomes dry. While the turkey is roasting, combine the reserved neck and giblets (except the liver), the water, onion, carrot and celery in a large saucepan; bring to a boil. Add the bay leaf, thyme and peppercorns. Reduce the heat and simmer, skimming and discarding any foam, for 1 hour. Strain the stock through a fine–mesh sieve into a medium bowl and let cool. Discard solids. If necessary, add enough water (or reduced–sodium chicken broth) to measure 4 cups stock. Transfer the turkey to a clean cutting board (reserve the pan juices and onions). Skim off any visible fat from the juices left in the roasting pan. Whisk 1/2 cup of the stock with the flour in a small bowl until smooth; set aside. Set the roasting pan over two burners on medium heat. Add the wine; bring to a boil and cook, scraping up the browned bits, until the liquid is reduced by about half, 2 to 4 minutes. Add the remaining 3 1/2 cups stock. Increase the heat to medium–high and return to a boil, stirring often. Boil until the liquid is reduced by about half, 6 to 8 minutes. Whisk the reserved flour–stock mixture and add to the pan, whisking constantly, until the gravy thickens, 1 to 3 minutes. Stir in the lemon juice (or lemon and orange juices). Remove from the heat and pour the gravy through a fine sieve into a large measuring cup. (Discard the solids.) Season with salt and pepper. Remove the string and carve the turkey. Serve with the gravy. Nutritional Information: (3 ounces turkey without skin & 1/4 cup gravy) 200 calories; 6 g fat; 1 g saturated fat; 2 g monounsaturated fat; 63 mg cholesterol; 6 g carbohydrate; 26 g protein; 1 g fiber; 250 mg sodium; 312 mg potassium. Notes: Look for Meyer lemons from late fall to early spring in well–stocked supermarkets and specialty grocers. If you can’t find them, use 2 teaspoons lemon zest and 1 teaspoon orange zest plus 2 tablespoons lemon juice and 2 teaspoons orange juice to make the paste. Place lemon and orange skins into the turkey cavity. Miso is undeniably salty, so a little goes a long way. White or sweet miso (Shiromiso) is yellow and milder in flavor than red miso. Look for it near the tofu in most supermarkets or natural–foods stores. Healthy Recipe by: Gurpareet Bains from his debut recipe book, Indian Superfood (Absolute Press, October 2010). Pour the olive oil into a saucepan, add the garlic and pine nuts and cook over low–medium heat for about 2–3 minutes or until the pine nuts have slightly toasted and the garlic is aromatic. Remove from the heat. Place the green beans, basil, black pepper and salt in a bowl. Add the garlic and pine nuts and toss to combine all the ingredients. Nutritional Information: (about 3 ounces) 54 calories; 3.5 g fat; 2.5 g protein; 2.5 g carbohydrate; 3 g fiber. 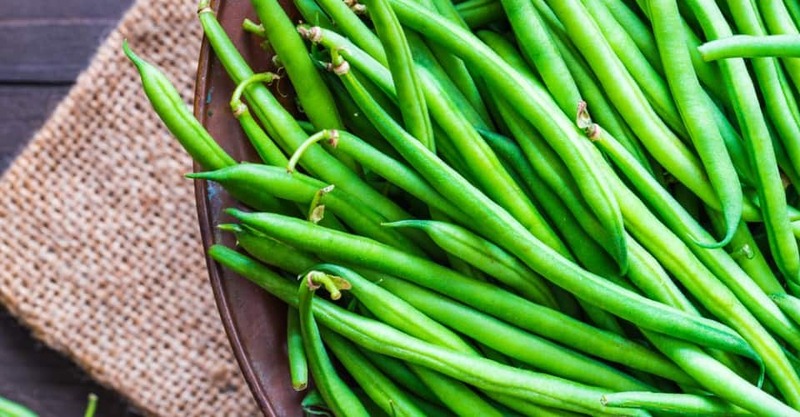 Note: The addition of a good dose of garlic to healthy green beans not only adds immeasurable taste but also helps produce more natural “killer” cells in the blood to fight off infections. Healthy Recipe by: Holly Clegg’s Trim & Terrific Diabetic Cooking (American Diabetes Association, June 2007). In a large nonstick skillet, heat the oil and sauté the sweet potatoes, onion and celery over medium heat for 7–10 minutes or until just tender, stirring frequently. Spoon the mixture into a large mixing bowl. Stir in the parsley and ginger. Add the cornbread and pecans and toss gently. Add just enough broth to moisten the mixture. Place the stuffing in a 2–quart oblong casserole. Bake uncovered 35–45 minutes, or until heated through. Serve. Nutritional Information: (3/4 cup) 211 calories; 5 g protein; 29 g carbohydrate; 9 g fat (2 g saturated); calories from fat 37 percent; 3 g fiber; 19 mg cholesterol; 355 mg sodium; diabetic exchanges: 2 starch, 1.5 fat. Notes: For a time–efficient approach, prepare the cornbread and toast the pecans a day ahead. Sweet potatoes are packed with vitamins and enhance the nutritional value of this recipe. Healthy recipe by: Deana Gunn and Wona Miniati, authors of The Cooking with Trader Joe’s Cookbook: Dinner’s Done! (Brown Bag Publishers, October 2010). Pulse the cranberries in a food processor or a blender just until roughly chopped. Transfer to a bowl and add the lemon curd, stirring to distribute it evenly. Stir in the pomegranate seeds. If using sugar and lemon, let the relish sit for an hour before serving. Nutritional Information: (1/4 cup) 41 calories; 0 g fat; 0 g protein; 11 g carbohydrate; 2 g fiber; 1 mg sodium. Notes: This raw cranberry relish is fantastic spooned onto pork or grilled chicken breast. Pomegranate seeds are the perfect sweet “crunch” in every bite of this fresh–tasting and tangy relish. It’s also a tasty alternative to traditional cooked cranberry sauce. Healthy Recipe by: TasteofHome.com, published in Healthy Cooking October/November 2009. Place the sweet potatoes in a 5–quart slow cooker coated with cooking spray. Combine the pecans, coconut, sugar, brown sugar, butter, cinnamon and salt; sprinkle over the potatoes. Cover and cook on low for 4 hours or until the potatoes are tender. Note: This recipe was tested with Land O’Lakes light stick butter. Nutritional Information: (2/3 cup) 211 calories; 7 g fat (3 g saturated); 5 mg cholesterol; 102 mg sodium; 37 g carbohydrate; 3 g fiber; 2 g protein. Healthy Recipe by: Cooking Light Way to Cook Vegetarian cookbook (Oxmoor House, 2010). Place the bulgur in a large bowl and cover with 2 cups boiling water. Cover and let stand 30 minutes or until liquid is absorbed. Fluff with a fork. Add the cucumber and all remaining ingredients; toss gently to combine. Nutritional Information: (1 cup) 197 calories; 9.6 g fat (1.3 g saturated, 6.7 g monounsaturated, 1.2 g polyunsaturated); 2.7 g protein; 28.2 g carbohydrate; 4.7 g fiber; 0 mg cholesterol; 1.2 mg iron; 186 mg sodium; 27 mg calcium.